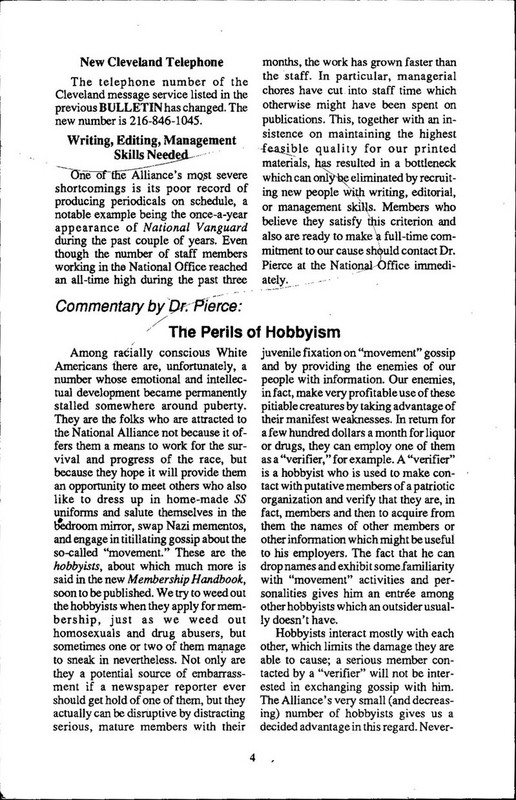 Introduction by Hadding Scott: “The Perils of Hobbyism” is a short essay from the National Alliance Bulletin of November-December 1992. At the time, Will Williams had recently become membership coordinator of the National Alliance. Harold Covington was continuing personal attacks against Williams which he had undertaken originally as retaliation for “The Anatomy of a Hypocrite,” a polemic against Covington credited to Williams and Ben Klassen that had been published by the Church of the Creator in March 1989. 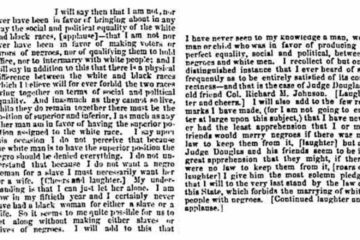 Dr. Pierce’s purpose was to warn the membership against being provoked into responding to Covington’s wild claims about Williams or other members of the National Alliance (which he published in his free newsletter called Resistance), since Covington would use whatever information he could gather from responses as material for fabricating even more stories, which would, by dint of containing some elements of truth, carry some credibility, and therefore be all the more destructive. Before he began writing to Alliance members, Covington spent most of his waking hours during the previous two years harassing a racially oriented organization headquartered at the time in North Carolina, the Church of the Creator, led by Ben Klassen. He wrote hundreds of letters, some ten pages or more in length, to members of that group asserting that Klassen was a Jew, a homosexual, a pederast, and a murderer. 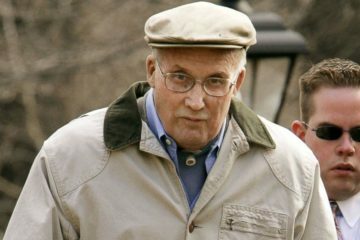 Mr. Klassen may have some ideas about diet (people should eat only uncooked fruits and vegetables), language (we should adopt Latin as a universal European language), and other matters which seem odd to many people, but he most certainly is not a Jew, a homosexual, a pederast, or a murderer. Covington’s technique was to mix half-truths with outrageous lies which he simply invented. Covington has had the audacity to claim that Dr. Pierce was his source for the rumor that Ben Klassen was responsible for the murder of a “Barry Edwards.” Here we have it from Dr. Pierce himself that this was bunk. Covington has claimed that Dr. Pierce accused him in this essay of being a verifier. Careful reading will show that he does not. The verifier seems to have been mentioned simply as an example of how somebody who takes a less-than-completely-serious interest in White Nationalism might add profit to his hobby, compiling lists of names for some agency. What Covington did to the Church of the Creator, as Dr. Pierce describes it, went well beyond identifying members. Dr. Pierce made a couple of insignificant errors: he referred to Frank Collin’s defunct organization as the American Nazi Party. Mainstream media often called it that, but the legal name was National Socialist Party of America. Also, Frank Collin was not born with the surname Cohn: it was his father who had made that name-change. Among racially conscious White Americans there are, unfortunately, a number whose emotional and intellectual development became permanently stalled somewhere around puberty. 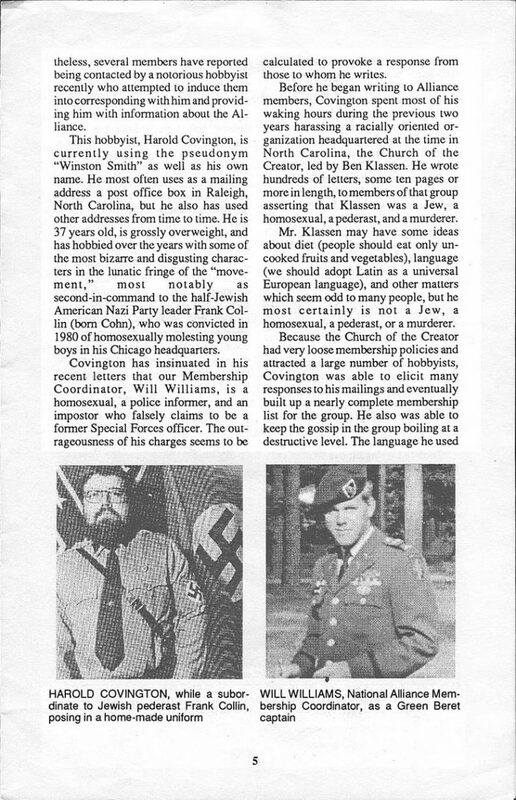 They are the folks who are attracted to the National Alliance not because it offers them a means to work for the survival and progress of the race, but because they hope it will provide them an opportunity to meet others who also like to dress up in home-made SS uniforms and salute themselves in the bedroom mirror, swap Nazi mementos, and engage in titillating gossip about the so-called “movement.” These are the hobbyists, about which much more is said in the new Membership Handbook, soon to be published. We try to weed out the hobbyists when they apply for membership, just as we weed out homosexuals and drug abusers, but sometimes one or two of them manage to sneak in nevertheless. Not only are they a potential source of embarrassment if a newspaper reporter ever should get a hold of them, but they actually can be disruptive by distracting serious, mature members with their juvenile fixation on “movement” gossip and by providing the enemies of our people with information. Our enemies, in fact, make very profitable use of these pitiable creatures by taking advantage of their manifest weaknesses. In return for a few hundred dollars a month for liquor or drugs, they can employ one of them as a “verifier,” for example. 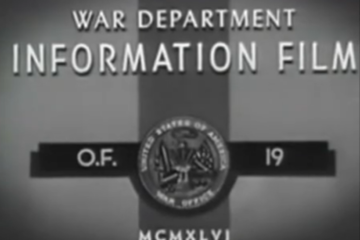 A “verifier” is a hobbyist who is used to make contact with putative members of a patriotic organization and verify that they are, in fact, members and then to acquire from them the names of other members or other information which might be useful to his employers. The fact that he can drop names and exhibit some familiarity with “movement” activities and personalities gives him an entrée among other hobbyists which an outsider usually doesn’t have. Hobbyists interact mostly with each other, which limits the damage they are able to cause; a serious member contacted by a “verifier” will not be interested in exchanging gossip with him. The Alliance’s very small (and decreasing) number of hobbyists gives us a decided advantage in this regard. Nevertheless, several members have reported being contacted by a notorious hobbyist recently who attempted to induce them into corresponding with him and providing him with information about the Alliance. This hobbyist, Harold Covington, is currently using the pseudonym “Winston Smith” as well as his own name. He most often uses as a mailing address a post office box in Raleigh, North Carolina, but he also has used other addresses from time to time. He is 37 years old, is grossly overweight, and has hobbled over the years with some of the most bizarre and disgusting characters in the lunatic fringe of the “movement,” most notably as second-in-command to the half-Jewish American Nazi Party leader Frank Collin (born Cohn), who was convicted in 1980 of homosexually molesting young boys in his Chicago headquarters. 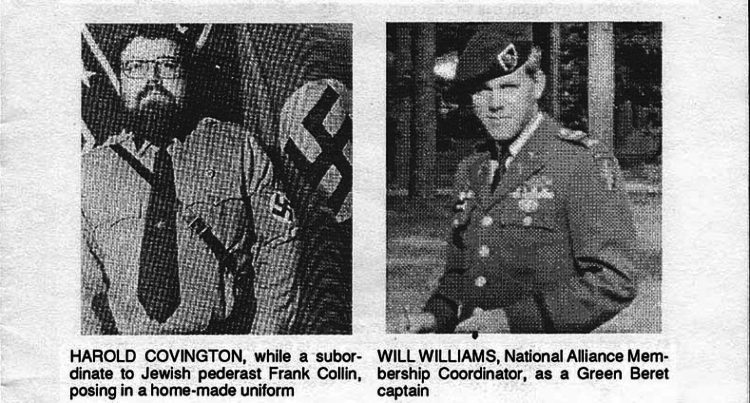 Covington has insinuated in his recent letters that our Membership Coordinator, Will Williams, is a homosexual, a police informer, and an imposter who falsely claims to be a former Special Forces officer. The outrageousness of his charges seems to be calculated to provoke a response from those to whom he writes. Because the Church of the Creator had very loose membership policies and attracted a large number of hobbyists, Covington was able to elicit many responses to his mailings and eventually built up a nearly complete membership list for the group. He also was able to keep the gossip in the group boiling at a destructive level. The language he used in his personal correspondence and in a newsletter he wrote (Resistance) was scatological and designed to appeal to teenaged males and to men with arrested personality development, but it also was witty and clever enough at times so that many of his correspondents were persuaded that he should be taken seriously. Covington’s technique was to mix half-truths with outrageous lies which he simply invented. 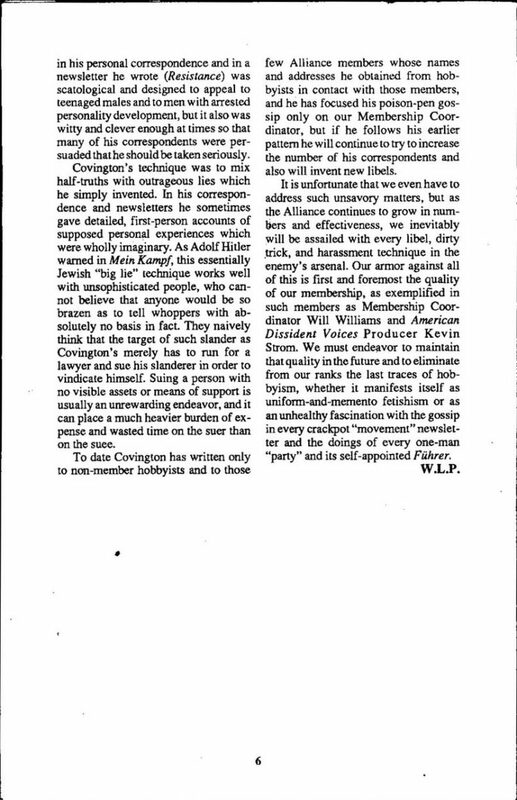 In his correspondence and newsletters he sometimes gave detailed, first-person accounts of supposed personal experiences which were wholly imaginary. As Adolf Hitler warned in Mein Kampf, this essentially Jewish “big lie” technique works well with unsophisticated people, who cannot believe that anyone would be so brazen as to tell whoppers with absolutely no basis in fact. They naively think that the target of such slander as Covington’s merely has to run for a lawyer and sue his slanderer in order to vindicate himself. Suing a person with no visible assets or means of support is usually an unrewarding endeavor, and it can place a much heavier burden of expense and wasted time on the suer than the sure. To date Covington has written only to non-member hobbyists and to those few Alliance members whose names and addresses he obtained from hobbyists in contact with those members, and he has focused his poison-pen gossip only on our Membership Coordinator, but if he follows his earlier pattern he will continue to try to increase the number of his correspondents and also will invent new libels. It is unfortunate that we even have to address such unsavory matters, but as the Alliance continues to grow in numbers and effectiveness, we inevitably will be assailed with every libel, dirty trick, and harassment technique in the enemy’s arsenal. Our armor against all of this is first and foremost the quality of our membership, as exemplified in such members as Membership Coordinator Will Williams and American Dissident Voices Producer Kevin Strom. We must endeavor to maintain that quality in the future and to eliminate from our ranks the last traces of hobbyism, whether it manifests itself as uniform-and-memento fetishism or as an unhealthy fascination with the gossip in every crackpot “movement” newsletter and the doings of every one-man “party” and its self-appointed Führer.